Islamist terrorists and airplanes make a bad mixture, which is not only known since the 9/11 attacks. This might be one reason, why advances of the so-called „Islamic State” on airports are monitored with even greater concern than its general military gains – and losses – in Syrian and Iraq. 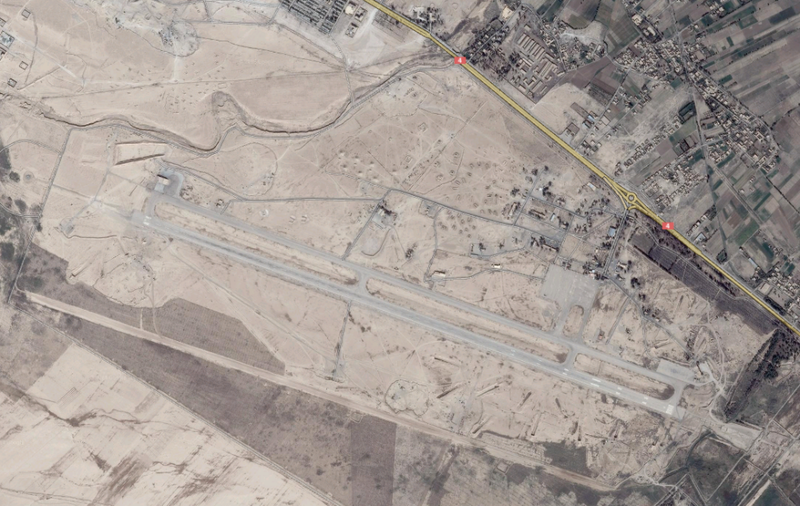 Despite the fact that the Islamic State controls some three to four landing strips in the two countries and was never able to start a single manned aircraft from these, its well-known assault on Deir Ezzor airport (map below) is not just a worry to the Assad regime, which holds it right now, but also to regional and western strategists, fearing fighter jets, helicopters as well as loads of heavy and advanced weapons could fall into the IS’ hands. The Islamic extremist organisation is controlling wide parts of Deir Ezzor city since months, which is located north east of the airport. However vague reports emerged over the last weeks, its troops are directly advancing on the airstrip. While this was harshly rejected by the Assad regime ministry of information, western intelligence agencies as well as major news portals had no information on the issue for weeks. On the other side – always “optimistic” – written claims by the terrorist organisation itself normally cannot be checked and thus have to be taken as unconfirmed, mostly exaggerated propaganda. Therefore to get to know the real extent of the territory the IS controls and the gains or losses they make remains only one promising way, which is the geolocation and analysis of their posted videos. Doing this over the last days I discovered that their advance on the airport itself moved further than most people expected (scroll down for my source tweets). 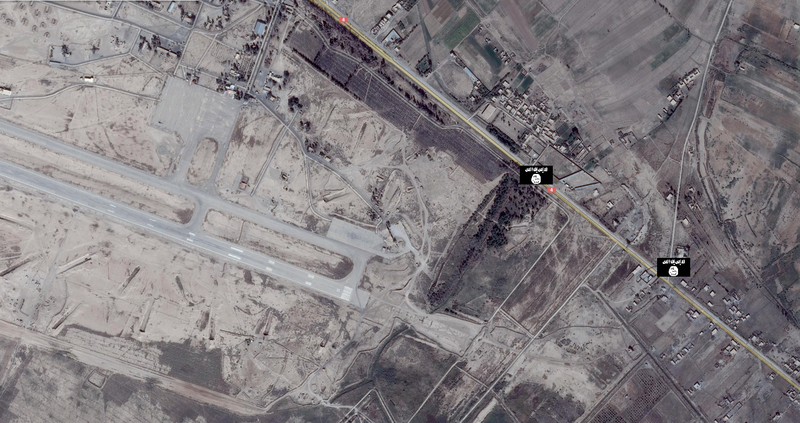 By precisely geolocating their videos it can be observed that they bypassed the city itself, advanced from the south east and took up positions, which are only 300 meters away from territory of the airport itself and not more than 600 meters from the runway and apron (see map below). Given the fact that they seem able to hold these areas for days or more, two different conclusions can be drawn. First, the Assad regime forces in the area seem to be thinned out and not strong enough anymore to counterattack these strategic positions and push back the IS troops from the perimeters of its airport. This is a telling aspect as it suggests, Assad as well as IS troops have approximately the same military strength in the area. At the same time both sides are weakened from battles at other frontlines, which do not run to their favour. Second, it can be assumed that at least fixed wing aircraft are not able to approach or take off from the south eastern direction of Deir Ezzor airport anymore as IS troops have positioned heavy machine guns in the area. These would be a far too big threat to low-flying aircraft. This means that – at least for now – the Assad regime cannot use its biggest advantage in the war in Syria, which has always been its air force. Finally, some final conclusions can be drawn from the most recent developments in the area. While the current advance and possible takeover of Deir Ezzor military airport by the Islamic State might be no big challenge for western governments and might not increase the threat level of aircraft-related terrorist acts, it might deal a deadly blow to the aspirations of the Assad regime in eastern Syria. The fall of Deir Ezzor airport would further weaken the Syrian dictator’s regime in an area, he already lost significant stretches of land and has little to no resources to fill up its thinned out ranks. Last but not least it has to be said that without the detailed geolocation of recent IS operational videos from the area, no reliable information at all would be available and no conclusions could have been drawn. You appreciate this site and my daily work on Twitter?! Please support me with 1$ per month or more.